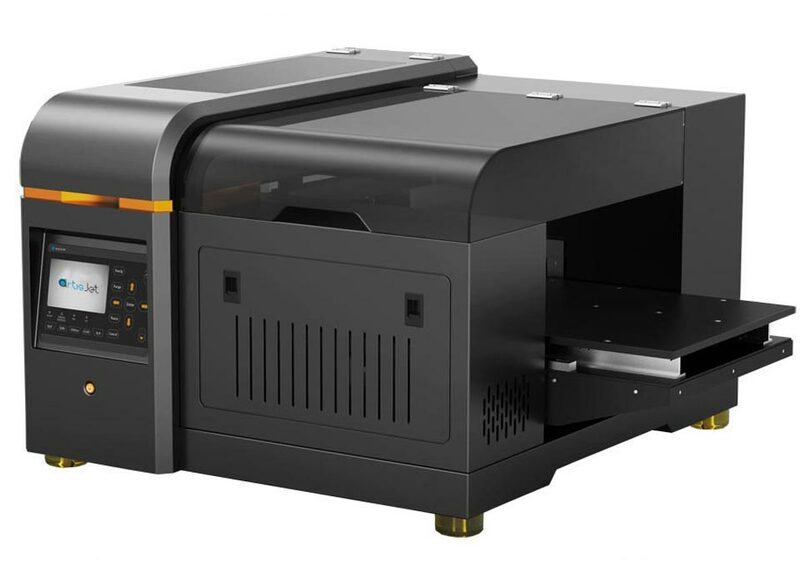 The Artis 3000U small uv printer is designed to print on both rigid and flexible materials . 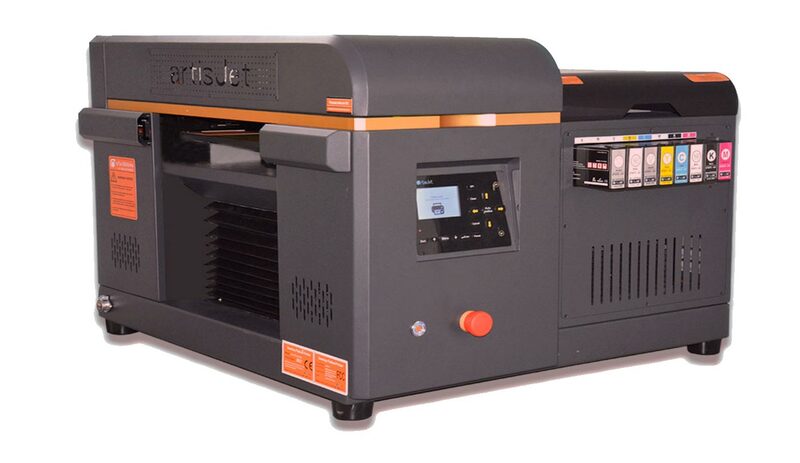 It instant dry in prints directly on wood, PVC, acrylics, leather, glass, crystal, ceramics, rubber, aluminum, copper, etc… The Artis 3000 is ideal for custom gifts, giveaways, personalized printing, golf ball printing, awards printing, PCB Board, industrial labels, small signage, phone covers, indoor decoration, etc… The ink system is based on an advanced LED UV curing system. It uses artisJet's proprietary direct to substrate LED UV ink. The LED UV ink technology allows the creation of amazing 3D textured and raised printing effects. Ideal print on both rigid and flexible materials, Amazing 3D textured and raised printing, Unique lateral loading platform design, Safe Water Cooling Control System, Automatic printhead height adjustment, Green air purity system, Control on demand system, Reformulated LED UV inks, Remote control panel. (1) Flash On Ink Firing System Intelligently powered by artisJet's FOIF system, the artis 3000 uv printer electronically activates the UV LEDs when firing ink only. As a result the life time of the printhead and the UV LEDs is maximized. FOIF also protects the entire ink system including the ink pump, the wiper, the damper, and the cap tops. (2) Continuous Ink Supply System Unlike ink cartridges, this system allows for 100% utilization of availabel ink. (3) Ink Display System Monitoring the ink levels to realize the continuous production in lower print cost. (4) HIS System Ensuring that the ink is heated to an optimum level providing peak performance with our specially formulated inks. (5) Reformulated LED UV inks Advanced TIO2 in 80 namos to keep the ink fluency including W color. 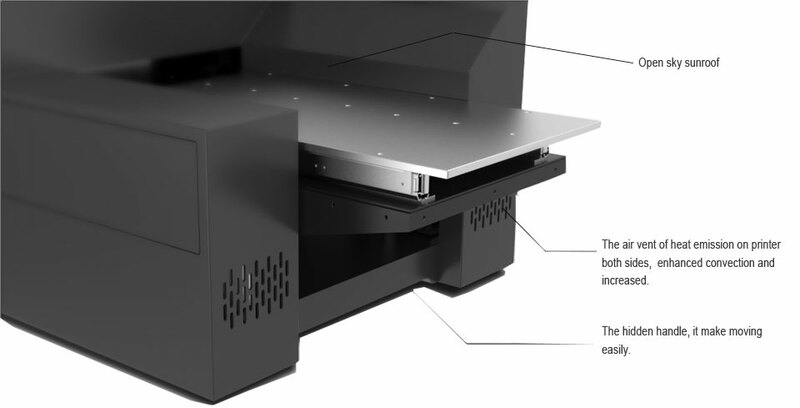 (6) Unique lateral loading platform design Watch the output process in an easier way and saving space. (7) Control On Demand System Designed for an enhanced flexibility and simplicity, artisJet COD digitally controls the operation of the LED UV system. It automatically adapts to different materials and working environments. COD controls the UV Curing model(Bi-directional, Uni-directional). This will result in delivering and optimal printing quality and drying time. (8) Safe Water Cooling Control System Designed for operational extra safety and simplicity, artisJet's SWCC system is built on a digital industrial chilling system. It recycles 200ml of an industrial cooling liquid. The liquid level is visible and refillable on demand to avoid the wearout of the UV LEDs. (9) Automatic Printhead Height Adjustment Equiped with sensors to automatically adjust head height and reduce print head strikes. (10) Remote Control Panel The RCP is a software module allowing the remote administration of the printer from your desktop computer. (11) Gree air purity sytem Reducing the smell and boasting. Air purity and particle recovery system.